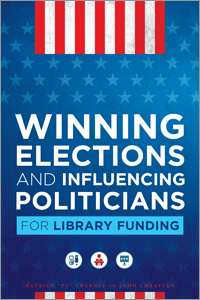 This post is the sixth post in a series on tools from political campaigns that can be used to arm librarians in the face of growing opposition during the Trump era where anti-tax and anti-government sentiments have a much stronger voice than ever before. Fundraising is the most difficult part of any political campaign. State and Federal politicians never stop fundraising and many of them start their fundraising efforts years before their campaign starts. In fact, it’s reported that politicians spend up to 30% of their time fundraising. That’s why, even if your campaign is years away, you should set up your ballot committee and start fundraising now! The earlier you get a financial commitment from your base of supporters, the sooner you can start spending it to persuade others to vote yes. If your campaign has no written plan, you have no campaign. A strong campaign has a strong plan written in clear and concise language that anyone working on the campaign can quickly and easily understand. Not only does this help introduce volunteers and staff to your campaign but it also really helps them understand the importance of their role. Of course, if you don’t write the plan down and the campaign plan only exists in your head and something happens to you or you have to leave a campaign for any number of reasons, the campaign will be left to start over from scratch. Don’t do that to people counting on you. I could talk for hours about the national, state, and local, data that libraries need to win campaigns and the terrifying lack of data in the library industry. But, even for our local campaigns, spending money early on getting good data will save your campaign many headaches in the future. A good pollster will help you find out who will vote for your library, if there is enough support to win, and they will help you find out why people will vote for you library. That’s why you need to hire a professional pollster to do the work the right way. If you run your campaign on bad data you’ll overspend or misspend your campaign funds and potentially lose the campaign (Hillary Clinton). A good pollster will help you determine what data you need and they will make sure you get the data you need. If your library needs a simple majority (50% plus one) of the voters to win an election or even if it needs a supermajority then you will need to find out what that number is before you begin. This number is critical because everything else you do depends on it and it will be your target throughout the campaign. Finding your win number is fairly easy and just requires a little research. For example, if your library is in a special election, look at the voter turnout in the previous 3-4 similar special elections, take an average, divide that number by 2 and add one (for a simple majority). Your win number and polling data is what is going to help you determine how much your campaign will cost. I often get asked how much it costs to run a campaign and the honest truth is that it depends. It largely depends on how many voters you plan on contacting, how you plan on contacting voters, how much each contact costs, and how many times you plan on contacting them. While these aren’t the only factors (there are many more) you can set a budget based on three levels of fundraising success. Once you have this budget in place, don’t throw it away. It is a living document and needs to be consistently updated and tracked. The two worst ways to lose a campaign are with money left to spend after Election Day or overspend your campaign too early with nothing left for the GOTV efforts. Take the time EARLY in the campaign to find out who is willing to vote yes for your initiative. If you can identify enough voters to get to that win number, you can spend highly targeted contacts on just yes voters solidifying their yes and making sure that they show up to vote on Election Day. This will drastically reduce the cost of your campaign and ensure that you are contacting the right people. This is going to be the hardest thing to do. This isn’t about handling opposition because there will almost always be opposition that you can’t ignore. Instead, this is about ignoring those silent no-voters. One of the worst things your campaign can spend money on is trying to convert no-voters to yes-voters. Conversion is extremely expensive and very risky for even some of the best campaign managers. If you can get to your win number with yes-voters (which you should be able to do according to your polling results), then you should be spending money finding out who they are and then spending money making sure they vote. There are so many digital platforms that a campaign can use. My recommendations are to use a good campaign website like NationBuilder and then focus only on Facebook and Email. The market saturation rate and the data that can be used for Twitter, Instagram, etc… just isn’t at the level it needs to be to be useful enough for small local campaigns. True, you can reach some people with Twitter, but is it the right people, enough people, and is it convincing enough? On a national or some state campaigns, this math changes, but for most library campaigns it just doesn’t add up. Digital is great but it won’t win your campaign. Don’t focus on it as the solution. You will still, absolutely, have to conduct a ground game to win a campaign. That means you and your volunteers will have to call your voters, write them letters, or knock on their doors. The face-to-face interactions (especially canvassing and phonebanking) of a political campaign still have the highest ROI so make sure they happen and make sure your volunteers are trained to do it right! The final week of a campaign is where you take all of your yes voters and make sure they show up to cast their yes votes. Don’t overlook this last week because all of the work you’ve been doing up until now won’t matter unless they show up to vote. Spend a large portion of your campaign resources contacting your yes voters and making sure they they cast their vote for your library. 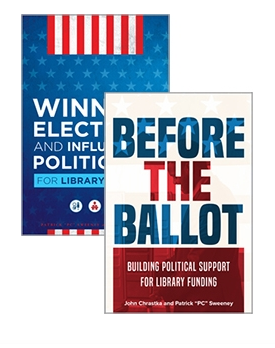 If you are interested in having EveryLibrary conduct a training to build political skills for your staff or librarians or speaking at your conference or staff development day you can get more information here. Or for information about my training, workshops and consulting, please view my speaking page.